Survival and Resistance: Power with Survivors, Power for Communities is a series of actions and events that center the stories, work, creativity, and lived experiences of survivors of partner abuse and oppressive systems. For many survivors, our identities and experiences shape how we exist and live in our communities. This campaign shares our stories to show how the tactics of partner abuse and the tactics of oppression are the same. We cannot end partner abuse until we end oppression, and to be able to support survivors we must see each other as whole people and work in partnership to eradicate all forms of violence. Below are some of the events and projects we have coordinated as part of Survival and Resistance. In June 2017, we kicked off Survival and Resistance with our first event, Wild Tongues: Stories for Ourselves. Wild Tongues reclaims power by highlighting the experiences of survivors of partner abuse and/or oppression with poetry, music, photographs, art, and choreography. We asked for survivors of partner abuse and oppression to submit their art and share their experience among a community full of support. 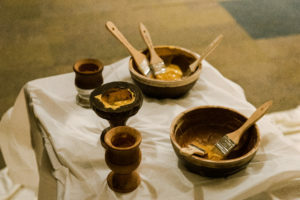 By popular demand, the second installment of Wild Tongues, Language of Rebellion, was held on February 7, 2019. Check out some photos from both events below. 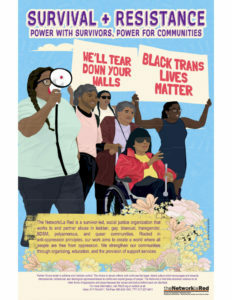 Filmed by local videographer, Jennifer Recinos, and starring movement artist, Fabiola Torralba, Surviving with Wild Tongues is a short film that centers the lives and experiences of queer, transgender, black, indigenous, working class and/or people of color who are survivors of partner abuse (domestic violence). The film features the voices of six anonymous survivors, and was launched on April 5, 2018 by executive producer and director, Genevieve Diaz y Rodriguez. Held on October 26 in honor of Domestic Violence Awareness Month, WE ARE: Survival and Resistance, launched the visuals for Survival and Resistance. The visuals, designed by the talented Rommy Sobrado-Torrico, consist of a t-shirt and two posters; one informational poster about the relationship between partner abuse and oppression, and one inspirational poster representing the theme of the campaign. Our goal is to share these visuals, especially our posters, with our communities and local organizations to spread awareness about partner abuse within the LGBQ/T, polyamorous, and SM communities and it’s relationship to oppression. We want folks to be able to recognize that both are about maintaining power and control so that we can learn to survive and resist in new ways. You can download our materials or request 11 x 17 posters below.